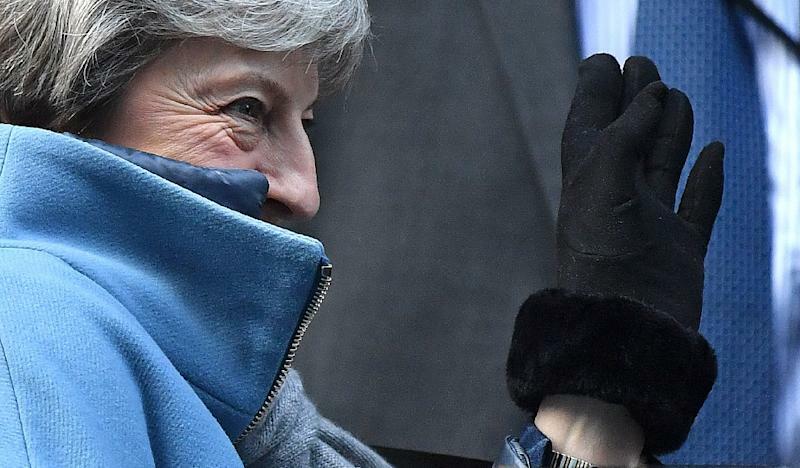 British Prime Minister Theresa May has said if her deal is voted down again "we will not leave the EU for many months, if ever"
London (AFP) - British leader Theresa May's government warned Sunday it might not hold a planned Brexit vote this week unless it feels it can secure a win that avoids a lengthy delay to pulling out of the EU. London has been paralysed by political inaction and chaos as it barrels toward the March 29 end of its 46-year involvement in the bloc without a plan. Parliament has twice resoundingly rejected the separation terms May reached with the other 27 EU leaders at the end of last year. 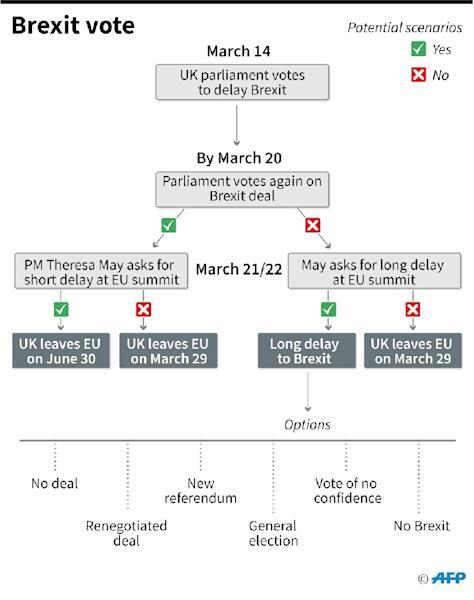 She doggedly vowed to bring them back by Wednesday for a third vote that -- if it succeeds -- would see her ask her European counterparts for a "technical" Brexit extension until the end of June. But May cautioned Sunday that another defeat would almost certainly require a delay so long that Britain would have to take part in European Parliament elections in May. This would mean "we will not leave the EU for many months, if ever," May wrote in The Sunday Telegraph. Two top ministers then warned that May might hold another vote only if she felt confident of winning over rebellious members of her own party and its Northern Irish coalition partners the Democratic Unionist Party (DUP). "It would be difficult to justify having a vote if you knew you were going to lose it," International Trade Secretary Liam Fox told Sky News. "We will only bring the deal back if we are confident that enough of our colleagues and the DUP are prepared to support it so that we can get it through parliament," finance minister Philip Hammond said on the BBC. "I mean we are not just going to keep presenting it if we haven't moved the dial." Some European ministers have suggested postponing Brexit until the end of 2020. A delay of 21 months could give Britain time to decide to either keep much closer EU ties or have Brexit reversed in a new national poll -- two possibilities welcomed by a range of European officials. The 27 other EU leaders will discuss their Brexit options at a summit in Brussels on Thursday and Friday. Hammond said the government did "not yet" have the numbers to win. "It's a work in progress and obviously we are talking to a lot of colleagues about what the way forward is," he said. May has run into political resistance from all sides. The stridently anti-EU wing of her Conservative party hates provisions that threaten to keep Britain indefinitely locked into the bloc's trade rules. May's Northern Irish coalition partners in the DUP -- a tiny group playing an outsized role in UK politics -- fear getting economically cut off from mainland Britain. And the opposition Labour party has followed an ambiguous policy while pushing for new elections that could topple May. But the pressures of time and the spectre of Brexit being watered down or reversed are starting to bring May additional votes. Former pensions secretary Esther McVey -- a vocal Brexit hardliner who quit in November in protests at the terms of May's divorce deal -- tweeted that "with nose held I will have to vote for the deal". 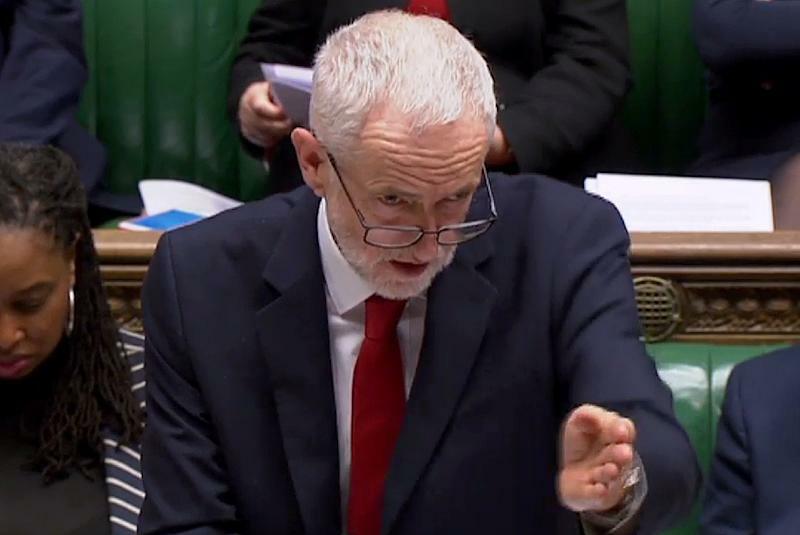 Labour leader Jeremy Corbyn said Sunday his group still refused to back May's "blind Brexit". But he added that he might sign up to a Labour proposal to have a new referendum after Brexit is postponed. The emerging idea is for Labour to back an amendment that would put May's deal -- were it ever approved -- up for a national vote. The referendum questions would offer "a credible choice that's real for those that wanted to vote leave, or did vote leave in 2016, as well as those that voted remain," Corbyn told Sky News. Polls show the public just as split about Britain's place in Europe today as it was three years ago. Most show the pro-EU camp ahead by a few percentage points. May wrote in The Sunday Telegraph that it was Britons' duty as "democrats and patriots" to make "honourable compromises" and unite behind her deal.